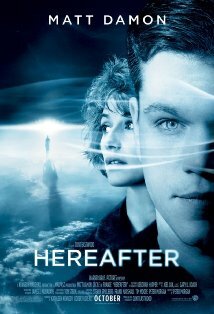 Hereafter is an engaging tale of life and hope through the eyes of the afterlife. Absorbingly slow and vicariously involving, the movie follows the stories of three people across three continents as they come to terms with their own experiences with death. George Lonegan (Matt Damon) is a medium - the real one, gaining his ability as a result of a series of near-death operations during his childhood. Even as he makes a living out of helping people connect with their loved ones after life, George realizes that the process is taking an emotional toll on him that he is not ready for and decides to give it up. Marie LeLay (Cécile De France) is a French reporter who is caught up in the 2004 tsunami and has a near-death experience that leaves her with with a new view of the afterlife. Marcus is a London school boy who loses his twin to an accident and finds himself withdrawn and desperately looking for some answers. As fate conspires to bring the three together, the audience gets a surprisingly non-religious discussion of the nature of the afterlife. Juxtaposing the message of hope against the finality of death is an easy thing to do. But doing so in a heartfelt manner, without degenerating to a theological debate or a pseudo-scientific babble, is the difficult part. Director Clint Eastwood, does a good job with straddling the line without picking sides, yet turning in a heartwarming character study with a rich narrative. The visuals are engaging and stunning in parts, the screenplay swings lazily between the uncomfortably tight and the luxuriously wide. Scenes almost always take longer than required, but manage to keep their relevance. Matt Damon displays his, to paraphrase my wife, honest humility that makes it easy to relate to him. Which, given the nature of his profession, is an achievement in itself. The twins George/Frankie McLaren are superb. The French are, well, French - fitting the caricature to a T. The other characters flit in and out of the storyline lending depth and relevance to it. This is not a movie if you are looking for a snappy storyline. The movie is slow. But it is a speed that is appropriate to the subject and narrative. And sometimes that subject may hit too close to one's heart; be prepared for it. All in all it is a great engaging drama to immerse yourself in and take with you even after the final credits roll.